Toei or Tokyo Metropolitan Bureau of Transportation is a rapid transit system that serves the city of Tokyo in Japan, in addition to the Tokyo Metro, and both of them together form the Tokyo Subway system. The system began operations in the year 1960, and presently has 4 lines that serve 106 stations. The system has a total track length of 109 km (67.7 miles). It is operated by Tokyo Metropolitan Bureau of Transportation. As per 2014 statistics, the system had an average daily ridership of 2.85 million passengers. Map of Toei Subway showing various lines and stations. Click on the map to enlarge it or Download Toei Subway Map in PDF. The subway service starts operations around 5:00 am and runs until midnight. On Toei subway, the regular fare is determined according to the minimal distance between the starting and the destination stations. There are various ticket types available to suit the needs of the passengers. Riders can purchase Toei one day Economy Pass, which provides unlimited rides for one day, on the Toei subway and buses, Toei Streetcar Arakawa line and Nippori Toneri liner. The pass costs ¥700 for an adult and ¥350 for a child. These can be purchased from ticket counters, Toei offices and other vending locations. Another option is Tokyo one day free ticket. This ticket can be used for unlimited rides on one day, on the Toei subway and buses, Toei Streetcar Arakawa line and Nippori Toneri liner, JR East trains and Tokyo metro. The fare is ¥1,590 for adult and ¥800 for child. These tickets should be used within one month from the purchase date and are valid for the specified date. A Toei Subway and Tokyo Metro Lines Common One Day Economy Pass provides unlimited rides on the subway and metro for one day. It costs ¥1000 for adult and ¥500 for a child. Similarly a Tokyo Travel 1- Day Pass can be purchased for ¥800 and ¥400 for an adult and child respectively. Riders can also pay using PASMO card. The card can be recharged and can be used repeatedly. It uses electronic money for payments and can also be used for payments at electronic money stores affiliated with PASMO. Toei subway offers park and ride facilities to passengers at most stations, there are enough parking lots available to park cars. The Toei subway provides a fastest and easiest way to get around central Tokyo. The tickets need to be validated at the ticket gates. Fare adjustments can be done at the fare adjustment machines located near the ticket gates, where riders can pay the due amount if they travel beyond the validity of the ticket. The transfer tickets need to be purchased in advance if transfers have to be made to Japan Railways or private railways. In addition, there are special carriages that are reserved for women only. The subway is also equipped with select seats, known as courtesy seats, that are meant especially for the elderly, disabled, pregnant women etc. Free wi-fi is just one of the features that this subway provides its passengers. It looks after all kinds of passengers and has gone the extra step, to make the disabled people feel so. All the stations are completely accessible in wheelchairs, in addition to which there are escalators and elevators as well. They have certainly gone the extra mile to look after their passengers which is extremely evident in their design on universally accessible toilets and low-level vending ticket machines. Special care is taken off the blind as well, with all the necessary information that is needed to use the subway, available in Braille. Currently Toei subway has four lines all the 4 lines are recognized by its color and name. 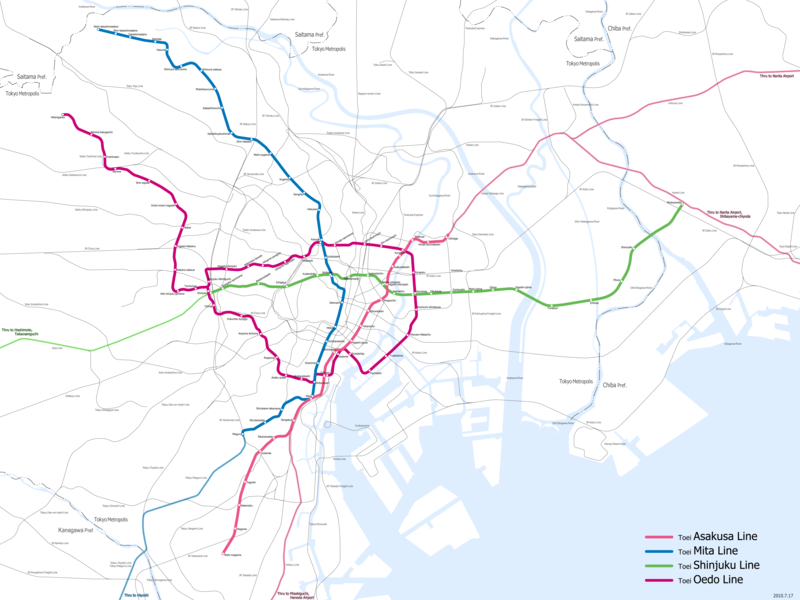 Line 1 – The rose colored line is known by the name Asakusa line and the subway offer service between Nishi-Magome and Oshiage. The length of the line is 18.4km serving 20 stations. Line1 started operation in 1960 and the station are recognized by the letter A. It is the first subway line constructed by Tokyo Metropolitan Government. Line 6 – The blue colored line is known by the name Mita line and the subway offer service from Meguro towards Nishi-Takashimadaira. The length of the line is 26.5km serving 27 stations. Line6 started operation in 1968 and the stations are recognized by letter l.
Line 10 – The leaf green colored line is known by the name Shinjuku line and the subway offer service from Shinjuku to Moto –Yawata. The length of the line is 23.5km serving 21 stations. Line10 started operation in 1978 and the stations are recognized by the letter S.
Line 12 – The ruby colored line is known by the name Oedo line and the subway offer service from Hikarigaoka to Tochomae. The length of the line is 40.7km serving 38 stations. Line 12 started operation in 1991 and the stations are recognized by the letter E.